If you are a home educator with internet access, then there’s a good possibility that you’ve been exposed at least a hundred times to ads about upcoming homeschool conventions. ‘Tis the season! 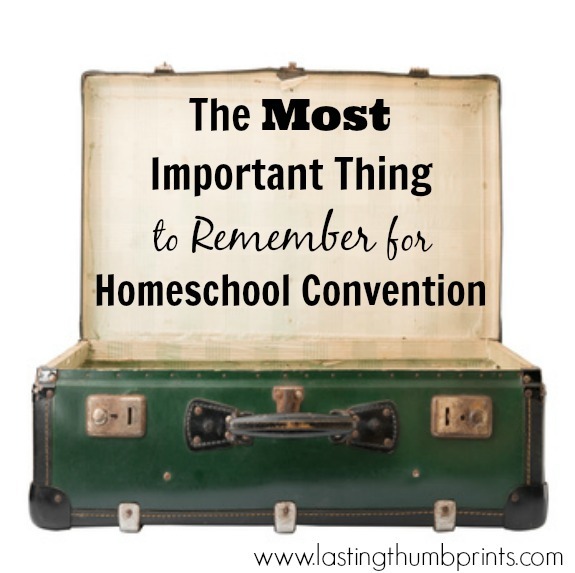 Homeschool conventions provide a wonderful opportunity for home educators to get a hands on look at curriculum, receive inspiration, and fellowship with other homeschooling families. Remember your vision for your homeschool. No one knows your children like you do. No one knows the heart behind your homeschool like you do. You are the expert. Don’t try to become someone else. Don’t try to take on someone else’s vision. When you go, be inspired. Go ahead and touch shiny new books and discuss them with the authors/publishers. Maybe even buy some. Ask questions of the seasoned homeschoolers. It’s all good and helpful. But just remember who you are. Remember why you homeschool and what your priorities are. Measure what you are hearing and seeing against that standard. Don’t allow yourself to be swayed by feelings of failure or incompetence. Don’t let doubt or comparison with others drive your thoughts. Make adjustments where needed – whether it’s your mindset or a textbook. But don’t judge your homeschool based on philosophies or trends that don’t truly fit with your vision. Stay true to who you are and your version of what homeschooling looks like. Because your version is distinctly made up of who you are and who your children are. And your version is beautiful. Thank you, Lorie. I’m in awe right now. 20 years of homeschooling! Boy, would I like to sit down and chat with you. 🙂 Thank you for your commitment and love to your family.